Today I was feeling lazy and a bit unwell so I decided to treat myself by trying out my BB Seaweed face mask. I picked this up with my Heads, Shoulders, Knees and Toes box because this is supposed to work well for my oily/combination skin. 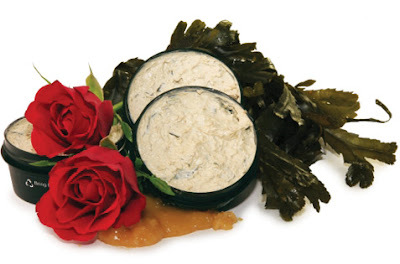 Relaxing and reviving, mineral-rich mask to cleanse, soften and beautify all skins. This blend, inspired by the sea, contains fresh and nutritious seaweed and seaweed absolute. Cleansing kaolin, antiseptic honey, calming aloe vera and rose absolute make this a great mask for everyone. I decided to try this out at night (just before bed) because my skin always seems to go red after I use face masks... is this just me, or does it happen to other people? However, that didn't happen to me today - my skin stayed... well, skin coloured!! This is the first Lush face mask I have tried, and I will probably be trying out some more, because I am impressed with this!! It left my skin really soft and moisturised but not greasy. One thing I noticed about this product was how difficult it was to fully remove. The Lush website says to rinse it off, but I had to use a face cloth and rub it off in some places!! Is this normal for Lush face masks? I know that other face masks I have used have been easier to wash off but the consistency of BB Seaweed was much thicker than any of those. I do like a thicker mask but this mask is kind of lumpy, which I'm not too fond of. Another possible downside to this product is the scent. The mask smells quite strongly of honey, so if you don't like honey then this is probably not the mask for you. But I really love honey (to eat and to smell!!) and I use the Ultra Bland cleanser (which smells similar to this) every day!! I've always wanted to try Lush. Maybe I will sometime. You definitely should - it's amazing! !